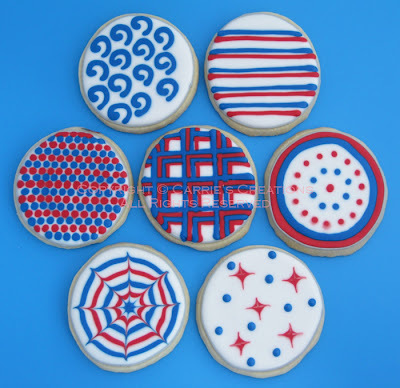 What do you do with leftover royal icing? Since I hate wasting food, I baked more cookies and topped it with the icing. Usually, I make more than I need for an order, because it's a pain to make another batch when you're already "in the zone." The patterns were not inspired by anything in particular. Just random dots and linework. The next set, I plan on bringing to the boys' daycare. 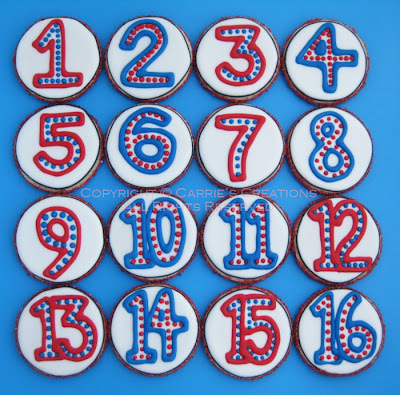 The edges were rolled into red coarse sugar and I iced numbers for learning purposes. I stopped the colour-alternating at 10... because I forgot... but that's OK, because I don't think the kids will care. 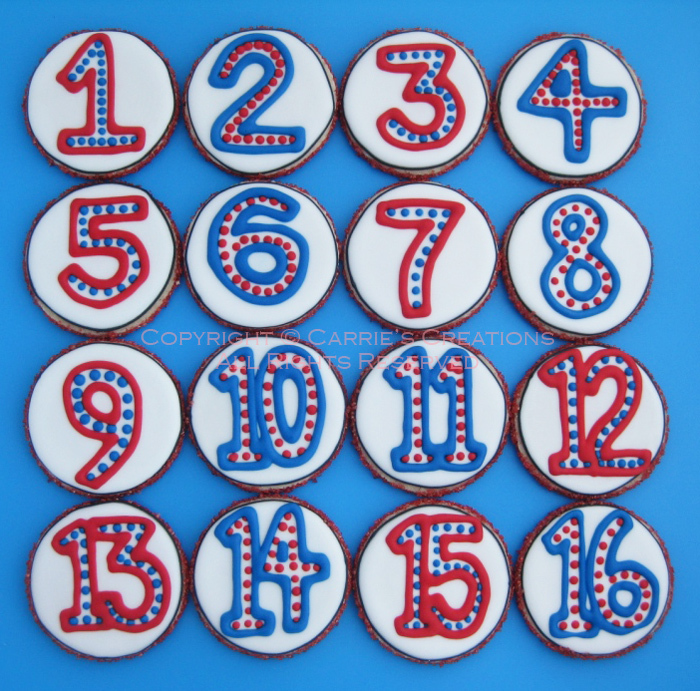 I hope they don't have favourite numbers, because I only made one of each up to 16! My other project due today was for a dinner party. A Paris-themed dinner party, to be exact. 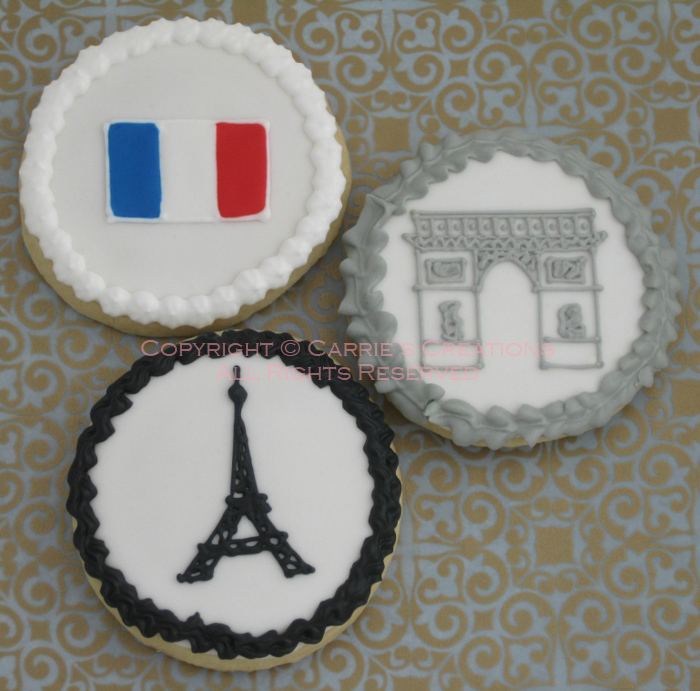 So, I used some of the most obvious French icons: the flag, the Eiffel Tower, and the Arc de Triomphe. This is something new for me: I haven't created a cake with peanut butter icing before. I looked for new recipes. 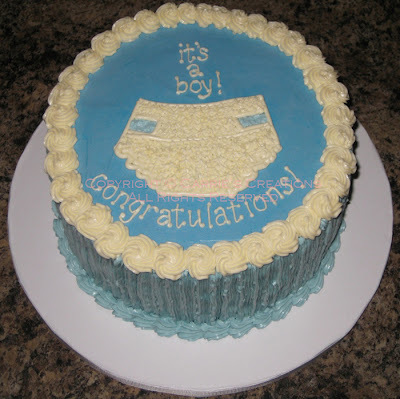 The icing is very, very sweet. The chocolate cake was divided into 3 layers. I wanted to do a basket weave design, since I haven't done that in a while. I totally forgot how easy it was to do yet it has a complicated look. It was a simple design and I only coloured the icing purple because it would be a very monotonous cake with all that beige by itself. 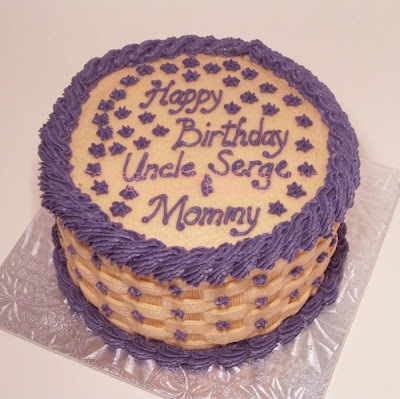 Happy Birthday, Serge & Krista (a.k.a the Super Mommy)! It seems like ages since my last post. Lots of changes since then... both the boys started daycare. With that, comes illness. Because their fevers have been yo-yo-ing and with other ailments, they've missed quite a bit of daycare since they're not allowed to come back for at least 24 hours. My husband was sick with the flu, and it appears that it was from the daycare, too. For the worst day, I took a day off work to be Mama Bear and tended to the little (and big) sickies. Now, I have a cold, as well, but at least it's not the flu. 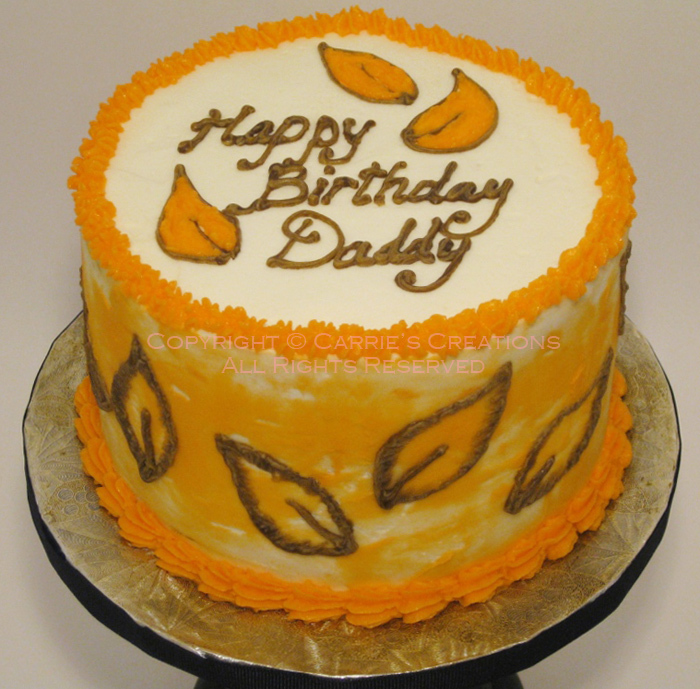 My favourite client wanted a vanilla chocolate chip cake with sweet icing. Sweeter than my usual Swiss meringue buttercream. I had to go for another recipe, so I found a whipped vanilla icing that used icing sugar. It does not hold up as well as meringue, but as long as it's taken out of the fridge a half hour before serving, it will sustain its shape. I had free reign on design and settled on an arty autumn theme. The icing didn't want to co-operate with me; it was very soft to pipe with, and needed to be refrigerated several times so I wouldn't pipe blobs. Other than that, I'm pleased with the results for the amount of time I spent on it (which is not as much as I wanted but my commute really takes a chunk out of my day). Today is my co-worker's last day in our department. We'll still see her, but she'll be on a different floor. She is a health nut. Or, she tries to be. 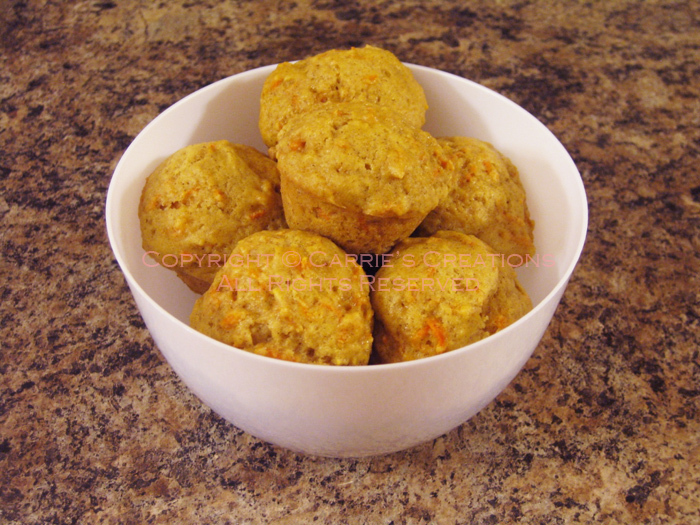 :) I wanted to make carrot muffins, but mini-sized (for those watching their caloric intake). This was my first attempt at carrot muffins... ever. I hope everyone enjoys them!